Why to Create Online Store with X‑Cart? eCommerce website installed and hosted by us. Get first 30 days of any edition for FREE. No credit cards required. X‑Cart is known as the best downloadable eCommerce platform. 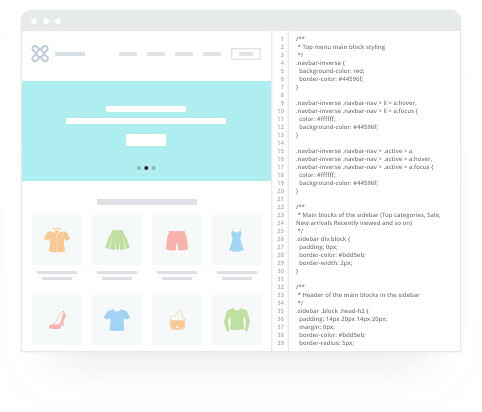 You have full access to the code to customize storefront and backend. You define who and how can access your online store data. No one knows what you sell, who you sell to and what your GMV is. That’s because it’s you who hosts it. But what if you want to try X‑Cart and not handle the server questions? Like, if you have no server? Or if you’re a "I‑don’t‑know-what‑MySQL‑is" person? If you want to breeze through the installation hustle? Starting an online store with X‑Cart is still perfectly possible! 1. Jumpstart an online store in seconds by submitting the form. Getting started is easy: choose an edition to play with. 3. Building your online store is complete! You have a high‑end eCommerce website, optimized for mobile commerce as well. Fast, efficient, attractive, and, which is most important, converting! 4. Login and start managing the eCommerce store. Add and edit products, connect payment gateways, enable shipping carriers to get shipping rates in real‑time. 5. Test it in all directions and get a professional 24/7 technical support, if you’re stuck. 6. By the moment when the trial period ends, you are ready to take informed decision. For sure, you will love the experience! Register a free license of buy a paid edition – what works for you best? Though there are dozens of online store builders on the market, you’re making the right choice, looking at X‑Cart. It’s the best eCommerce platform to start an online store, grow your business and conquer new markets. Adding and editing products process is a daily routine of store owners. You will be surprised, how friendly an eCommerce site can be. Add one by one or import in bulk. Upload images with drag and drop feature. Speed everything up with WYSIWYG editor and Bulk Edit feature. Preview the added products on the storefront and tweak the descriptions right there, thanks to Inline Editor. Following the best practices of selling online, create unique, informative, detailed product descriptions that both humans and search engines will like. Upload professional product photos. Attach a specification or a user guide. Let your customers attach an artwork for custom products you manufacture. Configure flexible product options and variations to fit the taste of the most choosy buyer, and no one will leave your eCommerce store without a purchase. Our professional designers have created beautiful eCommerce templates, where every product of yours will look great. Physical goods, digital goods, PIN codes or services. Membership-based access, subscriptions for periodical goods, product options and variations – X‑Cart can handle it all. X‑Cart has earned the trust of online businesses from the USA to Australia and New Zealand, from the United Kingdom to South Africa. X‑Cart supports multiple languages, currencies, weight formats, that’s what makes it such a universal ecommerce solution. We can even enable RTL support! Visit a theme store to buy one of 72 high‑converting responsive eCommerce templates, implement minor tweaks to match your brand and you are all set. Integrate a custom website design from scratch if you like. Everything is possible in the eCommerce solution of a dream! According to the recent research, major upgrades between branches are installed by 62% of X‑Cart 5 users. The minor upgrades, i.e the ones within the branch to get bug‑fixes and security updates, – by 80% of all X‑Cart 5 based stores. In any other self‑hosted platform with equal amount of customisations this figure does not exceed 10%. In other words, X‑Cart is the only eCommerce website platform on the market that will remain easily upgradable even with a custom design. Integrate a payment gateway that will process a cryptocurrency or enable Apple Pay in your store? Connect a Chinese carrier to calculate shipping rates in real time? Display the most recent videos from your Youtube Channel on the home page? You do not need Wix Code or any other fancy development tools to customize X‑Cart look and feel. Web designers and developers love this eCommerce solution not only for the ability to customize it from A to Z. The technology stack behind X‑Cart is pretty known to developers community: MySQL, PHP, Bootstrap, Twig, jQuery. You will easily find an affordable freelancer in India or an in‑house web‑developer. Fast one‑page checkout. Payment form right on checkout page (X‑Payments needed), Social login for fast registration and checkout. Coupons. Abandoned shopping cart reminder. X‑Cart will fight fiercely, like a tiger, for every order and every dollar of yours! PayPal is another top payment option – a must have, we believe! Without monthly fees for a merchant, trusted by millions of customers, safe and reliable. X‑Cart is a premium PayPal partner and we’re proud to recommend this solution for ecommerce businesses of all sizes. Online selling is impossible without accepting payments. Top ecommerce sites accept credit cards online. In X‑Cart, you will find an amazing collection of 120+ payment gateway integrations, all done in accordance with PCI compliance requirements. Just choose your favourite credit card processor, install and start selling. Host the payment page right on your eCommerce website and access 50+ payment processors with PCI Level 1 certified payment application X‑Payments. It also enables recurring payments and subscriptions, as well as “storage” of credit card details. All PCI‑compliant, thanks to tokenization magic. Offline payment methods – sure thing! Starting an online store, you do not want to see an abandoned shopping carts just because there were no payment method your target audience feels most comfortable with. Ideally, there must be several payment options enabled, as customers’ payment preferences differ. With X‑Cart eCommerce platform, it’s a no brainer! Checks, Cash on Delivery, wire transfer, phone ordering – these offline payment methods are also supported. Best eCommerce website builders have integrations with top shipping carriers like UPS, USPS, FedEx, CanadaPost, Australia Post, DHL. So does X‑Cart! To get started, you can find a free ready‑made integration in the app market. The carrier you select will return rates, delivery time and shipping methods in real time. No matter what shipping cost calculation method you enable and set up in your ecommerce store, there will be a pre‑login shipping cost calculator for your customers on the shopping cart page. The shipping rates will be updated once the buyer logs in or specifies the ship‑to address on the checkout page. ShippingEasy, ShipWorks, Stamps.com have direct integrtaions with X‑Cart. At the stage when you’re just building an online store, you will hardly want to pay extra to automate daily shipping tasks. But as your online business grows, you will want to optimise your entire shipping workflow for greater productivity and accuracy. Second, you can define the shipping rates manually, based on destination zones, as well as number of items, weigh or items, dimensions of the product box, and order totals. Over 400 hand‑picked extensions and themes from both X‑Cart team and vendors, free and paid ones, all reviewed by our QA specialists – that’s a treasure chest you have a key for! When you build an online store, you’re a frequent guest of an app market, or Marketplace. The convenience of X‑Cart marketplace is that you browse the extensions without leaving the administration area of the store. And, what seems like magic for a downloadable eCommerce platform, you install the extensions and professionally designed templates in a couple of clicks too! Without access to your server. Without files patching. Without a developer. Like in a SaaS solution! Spread the word: Market like crazy! In organic traffic we trust. "Rank high or die" – that’s the harsh reality of eCommerce website. Online Stores, powered by X‑Cart, do rank high. You have all possible tools to achieve this: sitemaps, all kinds of meta tags and titles, rich snippets, canonical URLs, SEO‑friendly category filters, Accelerated Mobile Pages and more. Google Analytics and Yandex.Metrica, Mailchimp’s eCommerce 360 feature and eCommerce Google Analytics. Diib analytics, Segment, CloudSearch and other apps to improve your customers’ engagement by times. Transactional emails powered by Mandrill. Email automation and on‑off emails powered by Mailchimp. Abandoned cart reminders to revive the pending purchases – all the best practices to start selling successfully. Getting started with a native mobile app for iOS and Android is easier than ever. Add a new marketing channel: introduce your business to 2.5Bn of Apple App Store and Google Play users. Put your products in front of more buyers in no time. It ensures blazing fast loading of your eCommerce store pages for mobile viewers. This enhances their online shopping experience and improves your online store SEO-health for Google. How the best ecommerce sites win at web design? Among all, they make their eCommerce themes friendly for every user. Teeny‑tiny screen of a smartphone, medium‑size screen of a tablet, 13‑inch display of a laptop, large display with Retina Support – if you create online store with X‑Cart, the storefront will look brilliant on any device. Just starting an online store or have been running it for a while? No matter how experienced you are in eCommerce business, sometimes, there will be questions beyond your competence. Should you need a helpful hand, we will be there in no time. Just give a whistle! Phone support, a chat or emails – what do you like most? Unlike SaaS eCommerce solutions, we never insist that you host your store with us. But as long as you’re free to leave to the hosting of your choice, we have no choice but to be irrevocably and unconditionally better than anyone else. 99% of customers who tried our professional fully managed hosting, stayed with us. Just because it rocks! X‑Cart is the only vendor that, in addition to an ecommerce platform itself, offers a full stack of eCommerce design and development services, migration assistance, SEO consulting, SSL certificates, domain names and more. Offering all kinds of services, we’re not trying to be monopolists. Vice versa, we encourage the community developers and web‑agencies to offer their services to X‑Cart customers. We believe that healthy competition is a win‑win for everyone, first of all – for you as an owner of eCommerce site who is looking for a top service at affordable price. Don’t put off until tomorrow what you can do today. Now is the best time. If you are hesitating because you don’t feel like you have learned about eCommerce everything you should, here are two ultimate starting‑from‑scratch guides for you. They will help you set up an online business and start selling online hands down. If you are certain to start selling today, but not sure whether X‑Cart is the best eCommerce platform for you or not, at least try it, or you will never know. To get started, no credit card is asked! In the unlikely even that you don’t like X‑Cart after the license purchase, unconditional 30‑days moneyback guarantee will relieve the pain of breakup. eCommerce website Installed and hosted by us. Ready in seconds. Be patient, the magic might still take us a few seconds. Your X-Cart store is ready and waiting. Please check your mailbox — your credentials should already be there.